What is the single, most important thing that matters most to me? It is simply…to know Christ and make Him known. This passion drives everything I do, personally and professionally. God did not make a suggestion to go and make disciples. His “go” meant “go.” My love and gratitude to Him, fuels the fire that burns within me to serve Him by serving others. My role, as Church Custodian gives me such great joy because I absolutely love taking care of “God’s House” through janitorial cleanup and organization. My work is my ministry. I want people who come to our church, to see the glory of God, and that glory (His perfection and holiness) is, I believe, tangibly demonstrated through ensuring facility cleanliness and order. My multi-faceted role covers cleaning all parts of the church campus, and its Pre-School, for each week, for Sunday services and for all events that use Tyner facilities. 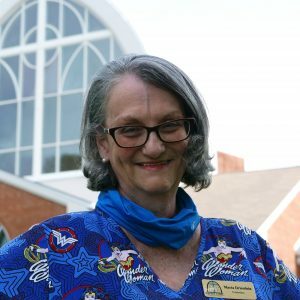 In 2016, I started out at Tyner UMC part-time in the Pre-School as their custodian, and now I am a full-time staff member/custodian covering both the Pre-School and entire church facility. I am often asked how is it possible for one person to be able to accomplish all this week-to-week. God has given me the gift of administration, which in a nutshell, is a skill in organization and project management, and the ability to maximize resources. I love my job!! That surprises people when I consistently state that fact. I really enjoy my custodial work, because it gives me such wonderful spiritual fulfillment to serve Him and the congregation. Prior to my work as a custodian, I served in the corporate world for over 30 years, as a motivational speaker and life coach, inspiring others to find their passion and to use that enthusiasm and drive as a catalyst to make a difference in serving others in their sphere of influence. There are a lot of things about me that surprise people. I love “shooting hoops” and playing basketball. For me, there is nothing like focusing one’s mind to make a basket, while simultaneously chatting with God thanking Him for how much the discipline that is used to be successful in making a shot, is so much like what the Apostle Paul states should be our aim in our Christian walk…to not allow distractions to make us miss the goal of holiness. Same thing. Same discipline. Same joy. I am a published creative writer (articles, poetry, prose, song lyrics, and web content), and through this venue, I encourage others to seek Christ first and to embrace the hope He gives us to allow Him to forge our life through the wilderness of hardships, difficulties and challenges. My life has been messy, and yes, oftentimes painful, but through the tears and anguish that comes with the journey, Christ has proven time and again, that in the mess there is always a message: God is always near and He will use our life’s hurt to ensure we discover His faithful; loving-kindness and strength to overcome any trial or tribulation. My story is not a story of loss or lack, but of the triumph of God’s faithfulness in the impossible. My heart, my passion is to be a vessel of God’s grace so that disciples and disciple-makers advance the Kingdom of God. I supremely enjoy showing others the majesty of Christ and the relevancy in day-today life of the finished work of the Cross and the power of the resurrection to raise dead things to life. To that end, I not only love to write, but sing as well. Currently, I am learning to play the acoustic guitar so that I will able to merge my writing, singing and musicality into one conduit to praise and worship Jesus, and to rally others to do the same. To me, there is nothing more important in life, work and in my being, than to “make God famous” by surrendering all to Him, anytime, anyplace, at all costs, so that He can be fully praised and glorified. My favorite quote is from Amy Carmichael, who, as a missionary, sacrificed her entire life in serving others. She declared in a poem which she wrote, “Make me Thy fuel, Flame of God,” That statement is my life prayer…to be used up by God for God. Want to know me? Know my God first, because I intentionally and thankfully live in the liberty of His truth which is: I am loved and known by God. He is all He says He is. He can do what He says He will do. And because of this certainty, I can do all things through Christ as God’s word and Spirit lives and is active in me. The Scriptures are like air to me, necessary and life-giving. There are many verses that come to mind that have kept my heart steady in this pilgrimage of rocky terrain and sometimes uncertain destinations. What a glorious privilege it is to be alive, living loved and known by God, and to praise Him without borders by serving others! The thought of Christ, His grace and endless mercy, what He accomplished on the Cross in my stead, and the tender feel of His embrace and presence as I go about my day cleaning bathrooms, washing floors, vacuuming rugs and shining windows…leaves me absolutely breathless!